This coloured lithograph is taken from plate 18b of Sir Charles D'Oyly's 'Views of Calcutta and its Environs'. The plate is composed of two separate images. 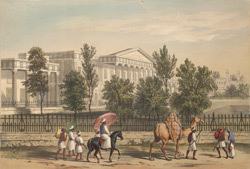 This one depicts the Islamic College of Calcutta. Now called the Calcutta Madrasah, it was set up by Warren Hastings in 1780 to train Muslim men for office in the courts of justice. It taught Arabic, Persian and Islamic Law. The original building was completed in 1782 and was situated on the south side of the Bow Bazaar, but the college moved to Wellesley Square in the 1820s.